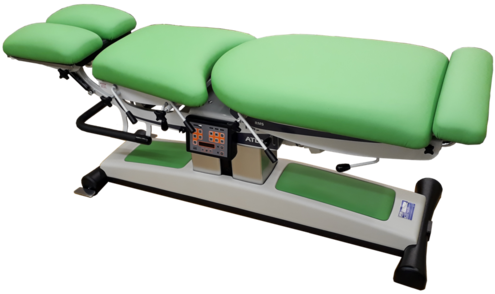 Atlas Clinical’s new RM tables build upon the success of the rugged and reliable RG series. The new design features twin lift motors for extra horizontal stability, and wider sub-frames for increased lateral stability. The pre-eminent Spinlite© drop mechanisms have been fully integrated into the sub-frames for greater precision and strength. The RM5 adds the capability of automatic, motorised, oscillating flexion and traction to the table. The computerised control console allows the practitioner to move the patient in flexion distraction modes with millimeter accuracy on a repeatable basis. Apart from the proven benefits in the management of disc problems, the cyclic action can also aid proprioceptive change in the aging spine.